Robert C. Martin was kind enough to review the code in this post at on his new blog Clean Coder. Be sure to read his review when you finish reading this post. After expressing an interest in reading Robert C Martin‘s books, one of my Twitter followers was kind enough to give me a copy of Uncle Bob’s book Clean Code as a gift*. This post is about my first refactoring experience after reading it and the code resulting from my first Clean Code refactor. The code used in this post is based on the data access layer (DAL) used in a side project I’m currently working on. Specifically, my sample project is based on a refactor on the DAL classes for comment data. 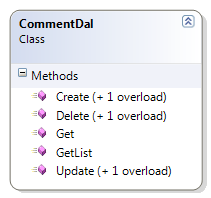 The CommentData class and surrounding code was simplified for the example, in order to focus on the DAL’s refactoring, rather than the comment functionality. Of course; the comment class could be anything. 3. This blog post is about 1,700 words, so if you aren’t into reading, you will still get the jist of what I’m saying just from examining the source code. Before starting, I want to point out that Clean Code is not about formatting style. While we all have our curly brace positioning preferences, it really is irrelevant. Clean Code strikes at a much deeper level, and although your ‘style’ will be affected tremendously, you won’t find much about formatting style. My original comment DAL class is in the folder called Dirty.Dal, and contains one file called CommentDal.cs containing the CommentDal class. This class is very typical of how I wrote code before reading this book**. The original CommentDal class is 295 lines of code all together and has a handful of well named methods. Now, 295 lines of code is hardly awful, it doesn’t seem very complex relatively speaking, and really, we’ve all seen (and coded) worse. Although the class interface does seem pretty simple, the simplicity of its class diagram hides its code complexity. This method can be simplified dramatically into a more readable style with fewer control statements. But first, notice how the methods are segmented into line groupings which are similar, with each grouping isolated with a single line of white space both before & after it, plus a comment to prefix most groupings. Each of these groupings is a smell, indicating each should be its own method. Before reading Clean Code, this was clean to me … this was beautiful code to me. Smaller well named classes & methods are easier to maintain and read. You may notice in the Clean.Dal directory, the classes are smaller, with file sizes hovering around the 50 LOC mark. 50 LOC for an entire class, when in the past, only my smallest methods would be less than 50 LOC. I’ve now realized; no code grouping is too small to separate into its own property, method, or even class***. Sometimes it’s wise to refactor a single expression into a property just to label it****. From the above code, you may notice not only how much smaller and simpler the ‘Create’ method has become, but also that its functionality has been moved from a method to its own smaller class. The smaller class is focused on its single task of creating a comment in the database and is therefore not only easier to maintain, but will only require maintaining when a very specific change in functionality is requested, which reduces the risk of introducing bugs. The small class / property / method idea extends to moving multi-line code blocks following control statements into their own methods. Also, as part of the small well named methods idea, detailed function names make comments redundant & obsolete. I’ve come to recognize most comments are a code smell. Check this out; my colleague Simon Taylor reviewed my code while I was writing this, pointed out that although my dynamic SQL was safe, colleagues following me may not see the distinction of what was safe, and may add user entered input into the dynamic SQL. He suggested a comment for clarification. Not only is this less likely to go stale, it will also clearly identify exactly what is going on both at the method declaration and everywhere it is called. Moving control flow to the polymorphic structure is another technique to achieve clean code. Notice the ‘if’s in the ‘Clean.Dal’ version are pretty much reserved for parameter validation. I’ve come to recognize ‘if’s, especially when they deal with a passed in Boolean or Enum typed method parameters as a very distinct code smell, which suggests a derived class may be more appropriate. Reusable base classes are also a valuable by-product of writing clean code. A reusable class library is not the goal in itself, in an anti-YAGNI kind of way, but is instead a natural side effect of organizing your code properly. Clean code is also very DRY. There is very little if any duplicated code. The structure is 100% based on the working, existing, code, and not on some perceived structure based on real world domain is-a relationships which don’t always match up perfectly. One more thing, unfortunately not everything is going to fit nicely into the object oriented structure, and sometimes a helper class or extension method will be the best alternative. See the CommentDataReaderHelper class as an example. New CommentUpdateCommand class and its inheritance hierarchy. One of the first things you may notice about this class, is there only one entry point; the static method Execute(). This provides a very simple and obvious way to use the class. You can place a breakpoint in this method and step through the class and its hierarchy to fully understand it. The class hierarchy is based completely on existing working code and was designed to share functionality effectively without duplicating code. Each class is abstracted to the point it needs to be, and no more, yet, the duties of each class in the hierarchy is crystal clear as if it was designed from the beginning to look like this. The AppCommandBase class manages an SqlCommand object. The ProcCommandBase class executes a given stored procedure. The CommentUpdateCommand class implements functionality specific to the comment update stored procedure and hosts the static entry point method ‘Execute’. When I started writing this, I didn’t know there were any downsides to writing clean code, but once I began this post, and started gathering evidence to prove how awesome the clean code strategy was, some evidence ruled against my initial euphoria. Here is a list of observations which could be looked upon unfavorably. Increased LOC – This was really pronounced in a later experience (Clean Code Experience No. 2 coming soon), but I actually thought the LOC was decreased in this sample. At least once you take into account the reusable base classes … but it wasn’t. While I haven’t done an in depth analysis of the LOC, it appears that the code specific to the comments, before taking into account any abstract base classes, has a similar LOC count as the Dirty.Dal class. Now much of this is from structure code, like method declarations, but it was still disappointing. Increased structural complexity – I suppose this should have been obvious, but it didn’t occur to me until writing this blog post, the complexity didn’t really disappear; it’s just been moved from the code to the polymorphic structure. However, having said that, I suspect, maintaining Clean Code with a vigorous polymorphic structure would be lower cost than a traditional code base. Method call overhead – With all the classes, properties, and methods, it has occurred to me, that method call overhead may have a performance trade off. I asked Uncle Bob about this on Twitter, and his reply was “Method call overhead is significant in deep inner loops. Elsewhere it is meaningless. Always measure before you optimize.”. Pretty good advice I think. But even after realizing the trade offs, Clean Code is still, clearly, the way to go. The Clean Code book has changed my outlook on how I write, and I think everyone should be exposed to this material. I’ve already re-gifted my Clean Code book, and the drive to write this blog post comes from a burning desire to share this information with my new colleagues. I would love to hear your input on this blog post, my sample code, and the whole Clean Code movement. Please comment below. Don’t forget to read Uncle Bob’s review at on his new blog Clean Coder. * Why did somebody I’ve never met send me a book as a give? Because he wanted me in the C.L.U.B. (Code Like Uncle Bob). And to answer your next question, yes I have since re-gifted the book. ** Very typical of how I wrote code before reading Clean Code … with the exception of some pretty nasty exception handling code. I removed it not due to its ugliness, but because its ugliness may have taken away from the code logic refactoring that I am trying to emphasize. *** And when I say no code is too small, stay tuned for Clean Code Experience No 2, which was so unconventional, it left me questioning if I’d taken this concept way too far. **** Although to be fair, I my first exposure to this idea was from Scott Hanselman after reading his first MVC book (this link is to his second MVC book). PS-Big thanks to Ben Alabaster to pushing me to write this post. The programming course I took way back in 1993 was basically a 1 year intro to C. And like any good student, as I learned the language, I also started learning about code reuse and experienced a delightful satisfaction every time I realized 2 different functions had similar code which could be moved into a new function. Eventually, I noticed a pattern, in that I would write a bit of functionality until it worked, then I would refactor it into a more elegant solution with as little repeated code as possible. My code evolved quite nicely. This Noun / Adjective / Verb design strategy seemed like the most ingenious piece of programming wisdom ever spoken … but it’s led us down a misguided path. It’s the verb that’s misunderstood. The verb should be another class, not a method. It should be a process class. As a programming concept, a process is just as much a ‘thing’ as any real world object. The verb should be a class, which accepts the noun as an input to be processed. But there’s also another problem; Up until this little shortcut was articulated, code was structured based on the implemented code, with similar functionality refactored into its own reusable units, but once noun/adjective/verb idea became widespread, code was suddenly structured according to domain. For example, the domain focus was really evident in the way we structured our ‘is-a’ relationships, with inheritance being based more on the real world domain, than the implementation code. Inheritance should be based on most efficient code reuse, not the domain, because as anybody who has heard the square is not a rectangle* example can attest, sometimes the domain ‘is-a’ relationship just doesn’t work. * With regards to the square is not a rectangle example, please be aware the solution outlined does not resolve the problem, as described in Uncle Bobs comment. The 1996(?) magazine article, The Liskov Substitution Principle is available, which contains the example as originally described. I didn’t post this url, since it’s not focused exclusively on the square / rectangle issue.